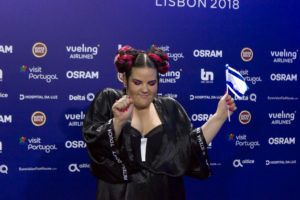 Several songs from the recently held Eurovision Song Contest enters the charts in Sweden with Israel’s Netta as #5 which is a good achievement, especially compared to how the winners over the last couple of year’s fared. The Swedish radio chart program “DigiListan” summed up the most streamed and downloaded songs over the past week. Since 2013, several Eurovision songs made it to the charts every year. The rate of success varied quite a lot from year to year. The 2013 – 2015 winners all ended up in the top 2 (Emmelie De Forest #1, Conchia Wurst #2, Måns Zelmerlöw #1) while in 2016 Frans was the highest placed Eurovision act at #10 followed by Dami Im in #17 and the winner Jamala at #46. 2017 saw the highest ranked Eurovision act at #18 (Blanche) while the winner Salvador Sobral was found at #33. This year Netta makes it to #5 with Benjamin Ingrosso at #11 (who peaked at #2 a few weeks after the final of Melodifestivalen) and Eleni Foureira at #15. The Swedish televoters favourite Rasmussen is found at #29.